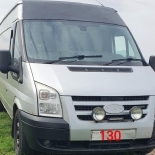 Ford Transit Forum • View topic - What Engine Oil? Ford now say 5w30 synth for all. I found it wept past seals so went back to 10w40. Regardless it's 6.15l including a new filter. What do you guys think of Smith and Allan lubricants or Westway? Both brands can be found very cheap on eBay and both claim to meet the relevant Ford specs. Also what is the difference between a premium brand oil and a budget brand oil if they both meet the same spec?